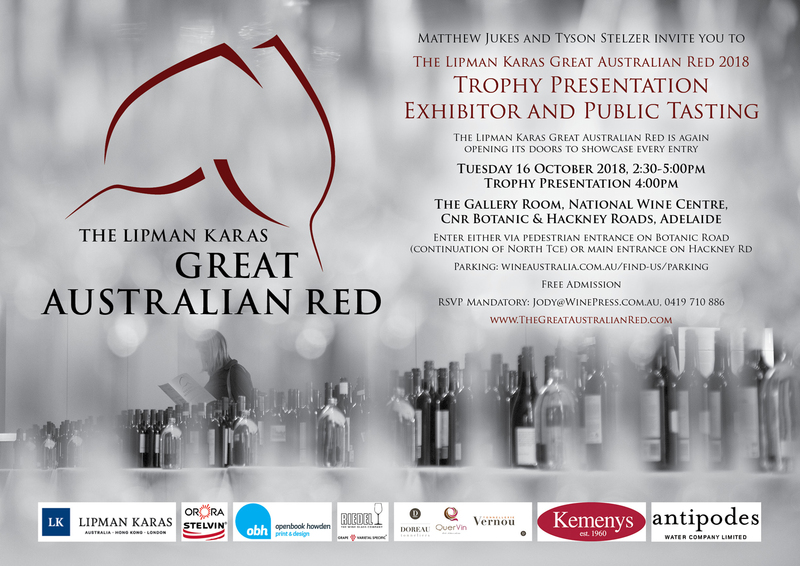 You are invited to taste the winners of The Lipman Karas Great Australian Red. Tyson Stelzer and Matthew Jukes invite you to join them in tasting every entry at The Lipman Karas Great Australian Red Trophy Presentation and Exhibitor Tasting following the judging in Adelaide. Please see the invitation below for full details or download a pdf version. Stay tuned for other tastings and events to showcase Australia’s greatest red wines around the world. Tyson and Matthew have taken the trophy and gold medal winners in The Great Australian Red competition on tour in New York, London, Sydney and Brisbane. Plans are currently underway to share the love in other key centres across the globe. For a pictorial overview of past events, please visit our Gallery. You are doing a great job of teaching us about Australia and how good Australian wine is. A brilliant experience to see the perspective of back vintages, an opportunity we never have here in the UK. A great tasting… Good fun… What you want is for the budget end to be really well made and unpretentious and for the premium end to be as unmade as possible.